Ansmann 4000042 Energy Check for AAA, AA, C, D & 9V. Indicator in 25% steps. 3 year warranty. 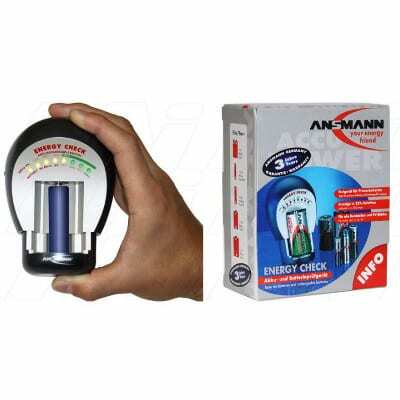 ENERGY CHECK – a multi-functional battery tester in an elegant design launched by ANSMANN. With this tester the remaining available energy of all common rechargeable batteries and primary cells can be quickly displayed in 25% steps. All types of batteries – alkaline, ZnO, NiCd or NiMH batteries – of the sizes LR 03 (Micro AAA), LR 6 (Mignon AA), LR 14 (Baby C), LR 20 (Mono D) and 6LR (9V block) can be easily checked. The 8 LEDs are clearly arranged and show the capacity of either disposable or rechargeable batteries in 25% steps. Thanks to its intelligent charging technology the actual remaining cell capacity can be determined. The compact and portable ENERGY CHECK can be taken wherever you go and used wherever you want.